You are here: Home › Motivation › So What’s Your Story? Everybody Has a Story So What’s Yours? One thing that we all have in common is that we have a story to tell. Although my story is about me, it’s also about what we have in common that might bring us together. It is about sharing your story in hopes that it will be a catalyst for change in someone’s life. We pass by people every day. Some of them cause our heads to turn for one reason or another and we make a summation about that person based on what we see on the surface. Even with people that we know casually, we make judgments about them based on what they allow us to see. Whether those judgments are good, bad or indifferent, it’s likely that we don’t know their story, and they are not offering to tell it and why should they? But why don’t they? Do they simply not want to discuss their storied life or jaded past? Is it a story riddled with perceived embarrassment and shame? Perhaps it is a story that brings great pain to think about? It’s a story that we don’t know and yet that very story would almost certainly cause us to spin our pre-judgment on its heels. I want to tell you about an episode of Dr. Phil. It was about domestic violence and at the end of the show; Dr. Phil’s wife introduced an app for women that were victims of domestic violence. And I thought to myself, I would like to reach out to local women and be of service to those women who have suffered or are suffering at the hands of an abuser. Well, I left it alone, and I woke up in the middle of the night as usual and I began to think of that app and how I wanted to reach out to those women. At the time, I had just enrolled the Coach Training Alliance program to become a certified life coach and I figured as soon as I knew what I was doing, I would reach out to different shelters. I would volunteer my coaching service to encourage these women. I didn’t want to wait though. I wanted to do it soon so that I could share an encouraging word. For a moment, I dismissed the thought of doing that because I had laid there and convinced myself that I had nothing to share with these women. Discouraged, I asked myself, what in the world would I say to these women? I wouldn’t know what to say. And then I smiled and said to myself, “Charita, you are these women. You’ve been a victim of domestic violence. You lived with it longer than you told yourself that you ever would. You would just tell these women that you’ve been where they are and that there is hope. You tell them that they can get beyond where they are. You tell them that they must have the courage to walk away and live the life that they were meant to live.” To sum that all up, I surmised that I would just tell my story. On a final note for those of you that have young people in your lives. I want you to be sure to tell your story, even the painful ones because there is a lesson in it for them. But you have to be crafty in that you can’t always do it in a way that is instructional, but rather as a matter of preparing them to make better choices. If you do it in an instructional or demanding way, the message may get lost, and they end up not hearing what you are saying. For God’s sake, be sure that the telling of your story doesn’t kill their dream. We want them to dream big, follow their passions and explore the world that coincidentally extends beyond the Alabama state line. 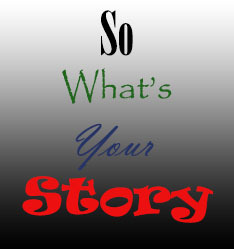 So in closing, I’m going to end right where I started with the question: So What’s Your Story?